Today I have swatches of the Sally Hansen Pearl Crush collection, which when I first saw the bottles shots of, I was really excited about them. Then I tried them and well…. (Index to Pinky) Lady Crab, Rainbow Fish, Silver Scallop, Oy-Ster it Up! Lady Crab has a sheer rosey pink base with blue to green shimmer and large iridescent hex glitters. 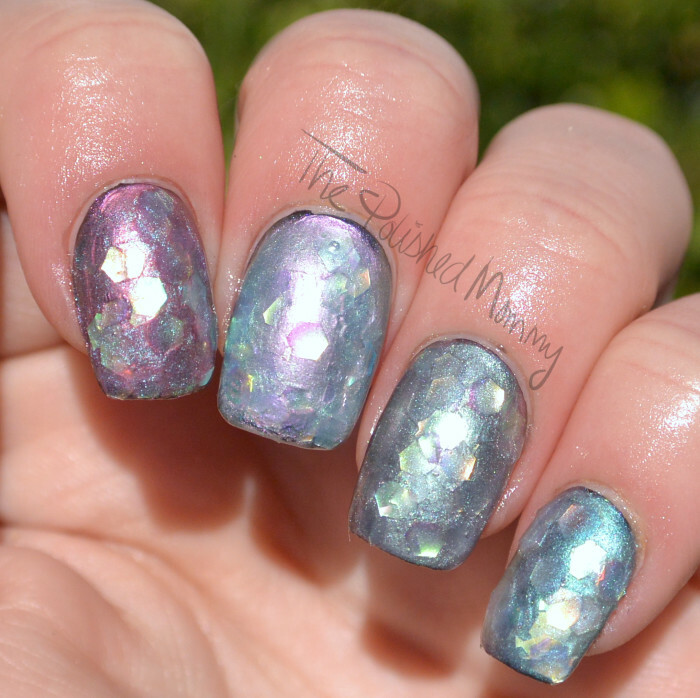 Rainbow Fish has a sheer blue to pink base with blue to green shimmer and large iridescent hex glitters. Silver Scallop has a charcoal grey/black to pink base with blue to green shimmer and large iridescent hex glitter. (sponged on over Sally Hansen Lapis Amethyst and B Polished Midnight in Death Valley) Oy-Ster it Up! has a sheer pearl base with blue to green shimmer and large iridescent hex glitters. I do really like the base colors of these, they match the corresponding Sally Hansen Prism colors almost exactly. However, the colors are very sheer and the formula is on the thick side. Because of this you do need to fish out the glitters, which makes applying it straight out of the bottle a little difficult. I will say that I really like the names of these, so it’s got that going for it. This was an LE collection that I believe has been clearanced out. March Madness: The Final Four…. Such a neat idea and so gorgeous in the bottle – but the polish is best staying in the bottle where it looks best. Like you I did a little happy dance when I first saw these in stores. Thankfully I was broke and didn’t buy any. Then I started seeing reviews and realized I dodged a bullet. I guess not all big brands get it right when they try to copy indies. Yeah, glad to see my suspicions confirmed, these just didn’t seem right to me when they came out. I bet an indie (oh, maybe like the fabulous B Polish?) could rock this though with a much better formula. Those gifs are perfect for this post. I don’t think I’ve ever disliked a full collection so wholeheartedly. IKR..nice concept but the formula a huge glitters ruined it.